Children of Arcadia, Mark Skwarek and Joseph Hocking, CAC Gallery, April 24-May 15 2009. Part of the Boston Cyberarts Festival. 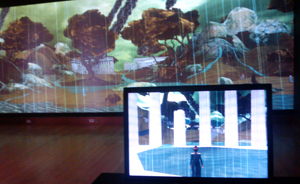 In Cambridge’s City Hall Annex, Children of Arcadia provides a wide vista onto a virtual world as well as a station for interacting. A visitor can guide a female character to different parts of the landscape. The pastoral scene, with the ruins of Wall Street buildings scattered about, features weather and other atmospheric effects that are keyed to current financial conditions. Plummeting stock prices seem to manifest themselves in darkness, rain, and billowing columns of smoke. Bullish markets would lead to sun and clear skies. Steering an avatar through this world could be more enjoyable. It seems that the character can’t affect anything or interact with other wanderers. Still, the view of the landscape and the connection to real-time data makes for a powerful, relevant image and works well in the installation context. The economic crisis is found “in arcadia” here, where the helplessness of the steerable characters is at least appropriate.